AnyMP4 iPod to PC Transfer is the easy-to-use iPod Transferring software to transfer iPod files to computer for backup. With it, users can copy music, movies, ringtone, camera roll, picture, voice memos, camera shot, etc. files to PC conveniently. Besides, this iPod to PC Transfer supports other Apple portable devices like iPad 4, iPhone 4S, iPhone 5S, iPhone 5C, etc. AnyMP4 iPod to PC Transfer can help you transfer all iPod files (music, movies, ringtone, camera roll, picture, voice memos, camera shot, etc.) from iPod to computer for backup. This iPod to PC Transfer supports all versions of iPad, iPhone and iPod like iPad 2, iPhone 5, iPhone 4S and the newest iPhone 5S and iPhone 5C, etc. So it applies to all Apple portable devices. 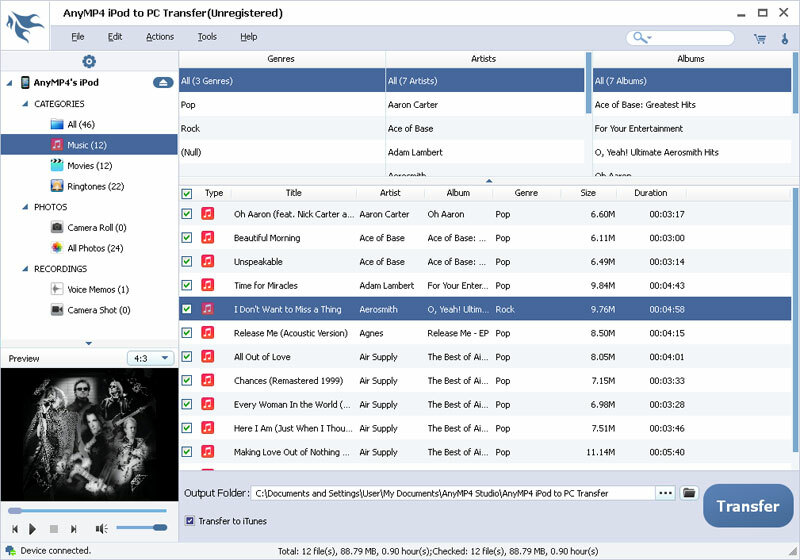 This iPod to Computer Transfer owns a built-in player, which can help users preview the video, audio and photo effect and finish all operations easily. Also, once you connect iPod to the program, there will be the detailed information of the device like version, capacity and type.